After Game 3 of the Eastern Conference final, I wrote about why I thought Jon Cooper’s Tampa Bay Lightning were in trouble. The CliffsNotes version of that piece was that the Bolts – who have made a living out of pummeling teams at even strength in the last five years – didn’t seem to have an answer for Washington’s speed or forecheck. You could have written up a bunch of ways that Washington, a talented team in their own right, would win the series. Outplaying Tampa Bay in the most critical game state was pretty low on that list, and ultimately ended up being the driver for why they are headed to the Stanley Cup final. The 4-3 series victory may actually have been a bit flattering to Tampa Bay. The Lightning were outscored 23 to 15 in the series and, more notably, 19 to nine at even strength. Sure, Braden Holtby was fantastic for the Capitals all series long, but Tampa Bay’s shooters – save for their power-play efforts – were quieted through most of the series. Ultimately that’s where the series was won. Tampa Bay’s big guns were kept quiet for the majority of the series, and particularly so in the hundred-plus minutes of even-strength hockey. 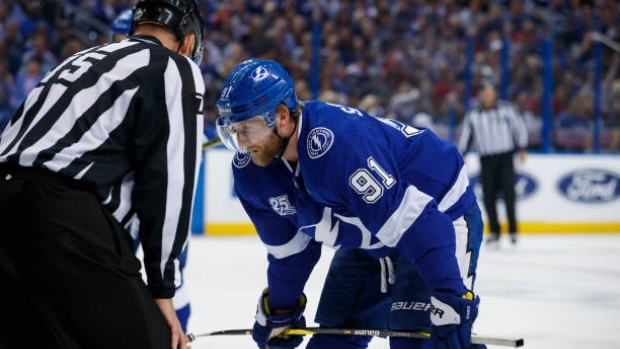 Steven Stamkos, perhaps Tampa Bay’s best player, compiled zero points on seven total shots. J.T. Miller was also scoreless on nine shots. Tyler Johnson, Nikita Kucherov, Yanni Gourde and others were goalless. You go down the list of Tampa Bay’s never-ending list of attackers, and all you see is how offence dried up. You can see the neutralization of Tampa Bay’s offence visualized below. The graph shows the change in shot generation, scoring chance generation (via NST) and goal generation from the regular season to the Eastern Conference final series. Outside of Ondrej Palat and Anthony Cirelli, pretty much every Tampa Bay Lightning attacker saw the rate at which he generated shots or scoring chances plummet. Correspondingly, each player saw a sizable reduction in the rate at which he scored goals. What’s really problematic here is that some of Tampa Bay’s highest-paid forwards – the aforementioned Stamkos and Kucherov most notably – were two of the least effective skaters in the series. It’s worth noting that Washington’s most prominent attackers did not see any sort of dip. Evgeny Kuznetsov, Andre Burakovsky, Alexander Ovechkin, T.J. Oshie, and so on were brilliantly effective and in some cases, posted better performance numbers than they did during the regular season. So, it’s not just that Tampa Bay ran into a hot goaltender. Holtby stopped a high percentage of their shots, but Tampa Bay didn’t exactly generate heaps of them either. Combine a generally ineffective offence with a strong opposition goaltender performance and you have a recipe for failure. You have to give credit to Washington here. The Bolts came into the series with the league’s highest-powered offence – they averaged 3.5 goals per-game during the regular season (best in the NHL) and 3.2 goals per-60 minutes at even strength. You never would have known it watching this series. There’s a beautiful irony in Washington getting to their first Stanley Cup in the Ovechkin era by way of stymieing the league’s most talented attacking unit. Perhaps it’s the 10 years of experience the Capitals have being on the wrong side of that equation.